Oil India Limited (OIL) invites applications from the eligible candidates (domicile of Assam and Arunachal Pradesh) for engagement to the under mentioned post on Contractual Basis in OIL Hospital, Duliajan. i) Passed 10+2 in any stream from Govt. Recognized Board/institute/ University. ii) Passed Two years full time Diploma course in Pharmacy from an institute recognized by the Government and the Pharmacy Council of India. 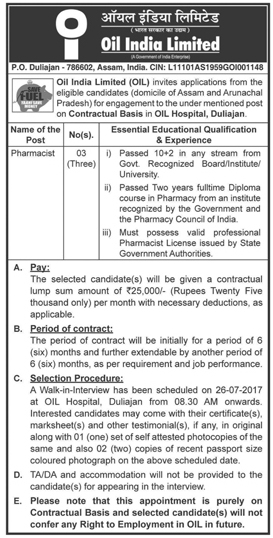 iii) Must possess valid professional Pharmacist License issued by State Government Authorities. Pay: The selected candidate(s) will be given a contractual lump sum amount of Rs 25,000/- (Rupees Twenty Five thousand only) per month with necessary deductions, as applicable. Period of contract: The period of contract will be initially for a period of 6 (six) months and further extendable by another period of 6 (six) months, as per requirement and job performance. Selection Procedure: A Walk-in-Interview has been scheduled on 26-07-2017 at OIL Hospital, Duliajan from 08.30 AM onwards. Interested candidates may come with their certificate(s), marksheet(s) and other testimonial(s), if any, in original along with 01 (one) set of self attested photocopies of the same and also 02 (two) copies of recent passport size coloured photograph on the above scheduled date.